Last month, more than 2 million people marched in cities around the world for climate action, and around 2 million people signed a global petition urging world leaders to stay within the 2-degree Celsius limit on global warming. It’s become increasingly clear that the world is ready for climate action. But humanity has just about run out of time to address climate change. Scientists have pointed out that a rise in mean surface temperature of 2º Celsius above pre-industrial levels will put the Earth in dangerous, uncharted territory. Yet we currently are on a path toward an increase of 4º or more this century. The climate negotiations in the coming 14 months, culminating in Paris in December 2015, will be the most important climate negotiations of our generation. A smart climate agreement requires a serious grounding in climate science, energy systems and climate policy. Here's how you can develop that expertise to be an active and informed citizen-participant in the coming negotiations. 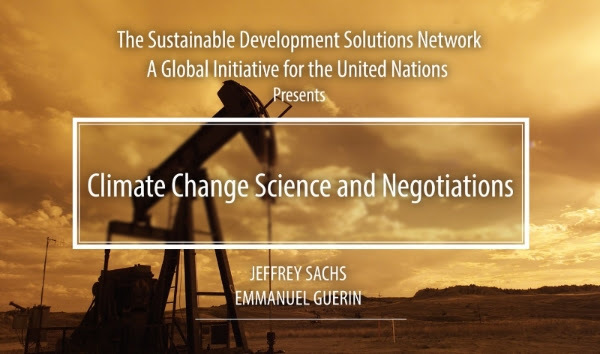 “Climate Change Science & Negotiations” is a new online course offered free by the Sustainable Development Solutions Network. It launches on Oct. 16, and is currently open for enrollment. This course is the first part of a two-semester course that introduces students to the science and policy environment surrounding climate change and is based in part on the findings of the Deep Decarbonization Pathways Project. The course will be taught by Professor Jeffrey Sachs, director of The Earth Institute and director of the Sustainable Development Solutions Network, and Emmanuel Guerin, the network's associate director. The second semester of the course will be a dynamic online climate change negotiation, modeled on the real negotiations under the United Nations Framework Convention on Climate Change. UN members are scheduled to reach an agreement in Paris in December 2015; the outcomes of the second semester simulated negotiations will be presented to global leaders in advance of that meeting. The course will explain the core of climate science; the reasons for the 2º Celsius limit agreed to by governments in 2010; the technological options for “deep decarbonization”; and the pathways and obstacles to a global climate agreement consistent with the 2º C limit agreed to by the world’s governments. We encourage you, your friends and colleagues to sign up, and to help us in promoting this course by forwarding information on to others. Feel free to post the description of the new course from SDSN.edu on your websites and post links to the course on social media, using the hashtag #climateclass and by tagging @SDSNedu. All SDSN.edu courses are offered free of charge and are open globally to anyone with an Internet connection. Any questions can be directed to edu@unsdsn.org.